Received: January 10, 2019; Published online: March 31, 2019. Cancer remains a life-threatening disease and accounts for the major mortality rates worldwide. The practice of using biomarkers for early detection, staging, and customized therapy may increase cancer patients' survival. Deubiquitinating enzymes (DUBs) are a family of proteases that remove ubiquitin tags from proteins of interest undergoing proteasomal degradation. DUBs play several functional roles other than deubiquitination. 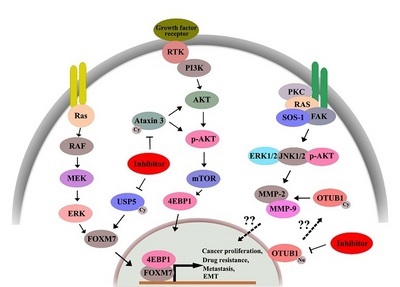 One of the important roles of DUBs is regulation of tumor progression. Several reports have suggested that the DUB family members were highly-elevated in various cancer cells and tissues in different stages of cancer. These findings suggest that the DUBs could be used as drug targets in cancer therapeutics. In this review, we recapitulate the role of the DUB family members, including ubiquitinspecific protease, otubain protease, and important candidates from other family members. Our aim was to better understand the connection between DUB expression profiles and cancers to allow researchers to design inhibitors or gene therapies to improve diagnosis and prognosis of cancers.